If operating earnings for 2010 and 2011 come in as anticipated, the market is certainly likely to end the year at a level that is higher than where the S&P 500 Index closed today, 1,030. As the below chart notes, the market does track reported operating earnings. After what has turned out to be a dismal second quarter for the market, many of the stocks in the S&P 500 Index are trading below their 50 day moving average. In fact, only 5% of the stocks are trading above their 50 day averages. This is a level that was last reached in mid May of this year and March of 2009. So on a short term basis the market certainly qualifies as being short term oversold. The percentage of stocks trading above their 150 day moving average at the end of June (20%), is lower than the May 2010 level of 26%. This moving average declined to only 2% as of early March 2009. This could be one of those examples where the market can stay irrational longer than an investor can remain solvent. For investors, company earnings reports for the second quarter, and more importantly, forward earnings guidance, will be critical in determining the direction of the market for the second half of the year. At this point in time at HORAN Capital Advisors, we are finding value in higher quality companies that are generating decent earnings and cash flow growth as well as trading at attractive valuations. Economically, there are a number of positives that we will touch on in our second quarter newsletter. The two biggest negatives though are housing and employment. If history doesn't repeat itself perfectly, it often looks similar. As the below chart from Chart of the Day details, it is not uncommon for the market to trade within a range after a strong recovery off of a significant bear market. On top of this, the market tends to be choppy during the summer months. If the presidential election cycle market plays itself out, a better market environment may be upon us beginning in the fourth quarter and carrying over into early next year. Investors can use this opportunity to build positions in higher quality companies that have pulled back in this market correction. 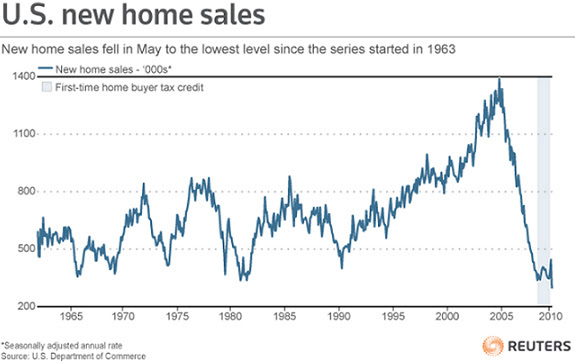 How Low Will New Home Sales Fall? A number of strategists are citing the fact the economic leading indicators index is rolling over based on April's report and thus the economy is rolling over as well. Investors should note though that this is not an uncommon occurrence when the economy is moving into its mid cycle phase. A recent report from Fidelity provides a chart of the LEI versus the coincident indicator index. "The number of leading indicators rising on a one-month basis fell significantly from seven out of 10 in March to four out of 10 in April (see Exhibit 3, right). On a more sustained six-month basis, eight out of 10 indicators rose in April—the same as the prior month. The declines on a one month basis were relatively small for all of the leading indicators except building permits, which fell 12% in April from the prior month--a sign of continued stress in the residential housing markets. However, continued strength on a six-month basis and mixed messages on a one-month basis could be indicative of the economy moving into the mid-cycle stage of economic recovery (emphasis added). While leading indicators tend to rise in near unison immediately following recessions, interpreting them becomes more difficult as the economic recovery gains footing because these indicators tend to rattle around in a more volatile manner. The Conference Board combines these 10 leading indicators into a weighted Leading Economic Indicators (LEI) index that helps paint a broader picture than any one of its subcomponents. As an economic recovery develops, it is helpful to observe these leading indicators alongside other data to gauge a recovery’s strength. The Coincident Economic Indicators (CEI) Index, which helps to gauge current economic conditions as opposed to the leading nature of LEI, is suitable for this purpose." "...my concern about long-run inflation comes not from the expansion of the Fed's balance sheet, but instead from worries about the ability of the U.S. government to fund its fiscal expenditures and debt-servicing obligations as we get another 5 or 10 years down the current path"
In the event inflation does take hold, what investments should an investor pursue to protect their assets? To answer that question an investor should determine whether they want to pursue an inflation hedge strategy or whether they desire an inflation protection strategy. The difference between an inflation hedge versus an inflation strategy is best summed up by Bill Ralls, CFA of Fidelity. "In theory, a perfect inflation hedge would be an investment whose price moves in the same direction, at the same time, and by the same amount as changes in the consumer price index. Of course, there is no perfect inflation hedge, and while past performance is no guarantee of future success, some asset types have been more successful than others. For a successful hedging strategy, an investment’s return should increase at least as much as and at about the same time as the increase in inflation—or the time lag should at least be measured in months rather than years. Whereas building in protection against inflation over the long haul requires a more holistic approach and a consideration of what asset types have tended to do best in different inflationary environments." From a hedging perspective, Treasury Bills, TIPS and commodities have the highest correlation to CPI as detailed in the below table. A perfect hedge would have a correlation of 1.0. Although commodities have one of the higher correlations, in periods of low inflation (Quintile 1 in the below table) the average 12-month rolling return for commodities is actually negative for all the rolling periods and commodities generated negative returns in 49% of the 12-month rolling periods evaluated. In high inflation environments, Quitiles 4 & 5 above, commodities had the best 12-month rolling returns. Given the volatile nature of commodity prices, they still generated negative returns in 16% and 28% of the rolling periods. As I noted in an article from a few years ago, Are Stocks A Good Hedge Against Inflation?, the important factor to consider is the direction of inflation. If the rate of inflation is slowing, i.e., increasing at a decreasing rate, the market is likely to view this as a positive for stocks. So in a high inflation environment, even stocks can be a good investment if the rate of change in inflation is negative. The conclusion in my earlier article noted, "in these tough times in the market, stock price returns will be impacted by events happening in the future and not by those that have already occurred. From an emotional standpoint, it is easy to let ones feelings for future stock expectations get clouded by past events. Being able to overcome these past influences is important in achieving positive investment returns." Is Gold's Bubble About To Burst? "...even on an inflation-adjusted basis, gold prices are higher now — two standard deviations above their long-term averages —than they've been since the early 1980s, when the U.S. was experiencing double-digit inflation. The metal is also “out of whack” with other commodities, a trend which has caused some puzzlement, even in places like the Federal Reserve." "...nonfinancial companies had socked away $1.84 trillion in cash and other liquid assets as of the end of March, up 26% from a year earlier and the largest-ever increase in records going back to 1952. Cash made up about 7% of all company assets, including factories and financial investments, the highest level since 1963." As the two charts below note, cash has been increasing on an absolute dollar basis (first chart) and also as a percentage of a company's debt level (second chart). For S&P 500 companies, debt has grown by 5.6% over the past two years whicle cash has grown by 42.6%. With a recent strengthening of the US Dollar versus the Euro and higher capital gain tax rates coming, US companies may use some of the cash to support corporate acquisitions both here and abroad. This same type of scenario played out when then president Reagan adjusted taxes in 1987. Additionally, given the level of cash, companies have the ability to step up dividend payments and dividend growth rates. At the end of the day, this cash growth does show company business prospects have improved. No doubt corporate level expenses have been cut as well, but growth in revenue and earnings is occurring. I suspect this revenue and earnings growth will continue through year end and into 2011. The rules for successful investing do not change just because the environment has become more uncertain. At HORAN Capital Advisors, we believe investing begins by clearly defining one’s philosophy and approach. Managers who stray from their discipline tend to reach for market returns and ultimately get caught in short term situations that can produce negative outcomes. A thoughtful, repeatable approach that emphasizes high quality investments can navigate volatile markets and provide for sustainable long-term outperformance. Attractive rates of return are achieved with dynamic asset allocation and a focus on high quality investments. Our philosophy emphasizes the importance of fundamentals and valuations. Investor euphoria and asset bubbles occur when fundamentals and valuations are ignored. ; therefore, screening for high quality securities takes patience and a disciplined process. The capital markets always present opportunity and value is added when undervalued investments are purchased and overvalued ones are sold. When we look at specific securities, the screening process must be clearly defined. For example, we approach individual equities by identifying criteria defined by a high quality approach. Companies must exhibit consistent growth, management strength, market dominance, and financial stability. Frequently, the byproduct of these metrics is a consistent dividend distribution. A company with the availability to grow its dividends is a sign of strong cash flow and profitability. The world has become a different place over the past decade. Household wealth has seen significant variations leading to nervous investors. Volatility may likely remain as the world reacts to sovereign debt issues, geopolitical concerns, and policy changes. Patient investors will find opportunities to invest in securities that have attractive valuations and growth characteristics. A strong and communicative client relationship enables us to establish an appropriate asset mix utilizing the global opportunity set. Our investment philosophy and core approach helps clients achieve their long-term goals and objectives. ...if one removes the impact of deficit spending, "the economy has recovered to the point where the year-over-year growth rate since early 2009 now matches the worst performance of any of the 50 years preceding the recent downturn." In effect, Wall Street's is seeing "legs" where the economy is in fact walking on nothing but crutches. Hussman's comment cites four variables he evaluates to determine whether we are in a recession or not. An update on the readings for these variables can be read in his weekly comment on the Hussman Funds website. He does conclude, "From my perspective, the evidence isn't yet sufficient, from a probability standpoint, to firmly anticipate a double dip. But it is notable how close the evidence is to locking in on that conclusion." "The bearish forecasters who rose to fame in the market crash of 2008 have, for the most part, not surrendered their pessimism. Their moment could be coming back around..."
"Last week, the Dow Jones Industrial Average rose above 10000—again. Since March 16, 1999, when it first touched 10000 in intraday trading, the Dow has bounced over that threshold and back 63 times. This Friday (6/11/10), the index closed 219.6 points below where it stood exactly 11 years ago." "in my nearly 50 years of experience in Wall Street, I've found that I know less and less about what the stock market is going to do but I know more and more about what investors ought to do." At the end of the day, one will not see the bull market coming, but all the bear market talk tends to be an indicator of a better market environment in the not too distant future. Dividend Payments Likely To Improve? "A dividend-oriented strategy has to be looked at over market cycles—there are times when it will lag, typically coming off a market correction or recession, and times when it does relatively well, usually in periods of market turbulence." Today, companies are in a position to once again focus on growing their dividends for several reasons. Strong Balance Sheets: Many companies are flush with cash. A recent Wall Street journal article noted, "U.S. companies are holding more cash in the bank than at any point on record, underscoring persistent worries about financial markets and about the sustainability of the economic recovery. The Federal Reserve reported Thursday that nonfinancial companies had socked away $1.84 trillion in cash and other liquid assets as of the end of March, up 26% from a year earlier and the largest-ever increase in records going back to 1952. Cash made up about 7% of all company assets, including factories and financial investments, the highest level since 1963." Sluggish Growth: In periods of slow economic and earnings growth dividends become a more critical part of the total return of a particular company's stock. In this environment companies are likely to respond to the investor's desire for more income from their equity investments. Since 1925, reinvested dividends have accounted for almost 44% of the total return of the S&P 500 Index. Less Volatility: Dividend paying stocks tend to be less volatile during downside market volatility. One factor we believe that will be present in the investment markets for the foreseeable future is a more volatile investing climate. A recent T. Rowe Price report notes, "dividend-paying stocks in the S&P 500 outperformed nondividend payers in every bear market since 1973 but tended to lag in bull markets, according to Ned Davis Research (NDR), a market research firm. During the bear market from March 24, 2000, to October 9, 2002, the S&P 500 plummeted 49.1%, while the Dividend Aristocrats gained 15.5%, according to Strategas Research Partners, another market research firm. In the recent market decline from October 2007 to March 2009, the Aristocrats declined 49.6%, compared with 56.8% for the S&P 500." Long-Term Performance: "NDR calculates that from 1972 through March 31, companies in the S&P 500 that have consistently increased or started making their dividend payouts provided an annualized return of 9.4%, compared with 7.3% for companies that paid dividends but did not increase them and only 1.5% for non-dividend-paying stocks." Steady Cash Flow: "From 1980 through 2009, dividends on stocks in the S&P 500 grew at an annual compound rate of 4.7% compared with the 3.7% annual inflation rate." Over a longer time period, principal growth of an equity portfolio outpaces that of a fixed income portfolio as well. The T. Rowe Price article cites a Ned Davis Research study showing this performance difference. "NDR tracked the performance of two portfolios over the past 25 years. One consisted of the top 50% of dividend payers in the S&P 500. The other was the S&P Long-Term Government Bond Index. The study assumed all interest and dividend payments were taken in cash each year. Assuming a $500,000 initial investment in each portfolio at the end of 1984, the equity index provided total dividend payments of more than $2.6 million through 2009, or about $212,000 more than the total interest payments from the bonds. Moreover, in terms of principal value, the original $500,000 investment in the stock portfolio grew to more than $2.8 million compared with about $908,000 in the bond portfolio." For an investor then, a resumption of dividend growth could be at hand. The stock prices of dividend growers will likely benefit from this growth as well. If history plays itself out, outperformance of dividend payers, over the long run, is likely to continue. Just because the market seems oversold, this does not mean it will move higher in the next day or week. I wrote a post on May 31st titled, Seems Like The Market Is Oversold. At that time the S&P 500 Index was trading at 1,089 and closed today at 1,050 or 3.5% lower than the 5/28 close. What does seem to be the case though is the selling pressure is subsiding in spite of the late day sell off today. Trading volume on these down days continues to occur on successively lower volume days. Additionally, the percentage of stocks trading above their 50 and 150 day moving averages continues to decline. The percentage above their 50 day M.A. is not too far from the percentage reached in March of last year. With this recent pullback, there are a number of high quality stocks that are trading at attractive valuations and yields. Investors might use this opportunity to initiate or add to these positions if they have cash set aside for equity purchases. The performance of the dividend paying stocks in the S&P 500 Index trailed the non payers in May by 1.34 percentage points. The payers returned -7.75% versus -6.41% for the non payers. On a year to date basis the payers have a slight edge, 3.20% to 3.11%, respectively. The market's performance around the presidential election cycle is one technical data point that seems to garner quite a bit of press-so here we go. Standard & Poor's recently updated the cycle data through the first quarter of 2010 and going back to 1945. What the data suggests is the worst performing period for the market is Q2 and Q3 of the second year of a president's term. As the below table notes, the second quarter averaged a loss of 2.0% and the third quarter averaged a loss of 1.0%. For the quarter to date period in Q2 of this year, the S&P 500 Index is down 8.61% through the market's close on June 4th. This 8.61% decline is far worst than the average decline of 2.0%. In fact May's return of -8.2% is the worst May return for the market since 1962. For Q4 of the second year, Q1 of the third year and Q2 of the third year, the frequency of positive returns was over 80%. For a sign that the market might achieve these positive returns investors should look for market leadership in the cyclical sectors like, autos, steel and equipment related firms. So seeing positive momentum from the industrial, materials and some consumer discretionary related companies could be a signal that the market will resume its upward advance. In looking at the chart technicals for the S&P 500 Index, downside volume has been on the decline. One question that jumps out in the chart is whether the red line around the 1,050 level on the S&P is support or whether it is the neckline in a head and shoulder chart pattern. If the market can push through the 1,150 level on the S&P, i.e., break the resistance of the left shoulder of the pattern, technically the market could see additional strength. In the end though, the market will trade on fundamentals. We are cautiously optimistic about the market through year end. With this recent pullback, there are a number of high quality companies that are trading at attractive valuations and have decent yields. The market will not move higher on a straight line basis and volatility is likely with us for some time. However, investors are getting an opportunity to begin building positions in attractive high quality companies at this point in time. Whistling a New Tune in June? Stocks Undervalued and/or Bonds Overvalued? Below is research on the difference between stock and bond yields and subsequent 12-month forward stock market returns. The data was pulled together by Argus Research. "The chart below depicts (on the right axis) the gap between the yields on the benchmark 10-year Treasury note and the S&P 500. Plotted against this series is the performance gap between the return on the S&P 500 and the return on the 10-year Treasury over the subsequent 12-month period. Generally, a yield gap of 400 basis points or less has proven bullish for stocks. More notable, however, is that extreme levels have been very predictive of the market’s future direction. For example, the yield gap peaked in the fourth quarter of 1999 at 535 basis points, accurately foreshadowing that stocks were quite overvalued relative to bonds. Alternatively, in March of 2003 the gap had shrunk to just 150 basis points as bond yields had plunged and stock prices had sunk to bear market lows (thus pushing up dividend yields). The current readings are even below the March 2003 levels, suggesting that stocks are quite undervalued." One sentiment indicator that has a fairly wide following is the Smart Money Dumb Money Confidence Index pulled together by SentimentTrader.com. As the below chart notes, the smart money indicators of the so called smart investors are starting to signal i more optimistic market environment. "In general, you want to follow the smart money traders—tracking indicators such as commercial hedger positions and the S&P 100 index (OEX) put/call and open interest ratios. In contrast, you want to do the opposite of what the dumb money traders are doing—tracking indicators such as the equity-only put/call ratio, flows into and out of the Rydex series of funds and small speculators in equity index futures contracts. As the old adage goes, markets can stay irrational longer than you can stay solvent, so I’m not here to judge the precise end to this correction. As we’ve noted, the market had been overdue for another pullback, one likely to be less benign than those that preceded it in light of stretched technical and sentiment conditions. In fact, it’s usually soon after the first year of a new bull market (cyclical or secular) that the market experiences its first 10%-15% correction."